News: Schroder finished with 17 points (5-11 FG, 2-3 3Pt, 5-6 FT), six assists, five rebounds and two steals across 32 minutes during the Thunder's 120-108 win over the Trail Blazers in Game 3 of their Western Conference first-round playoff series Friday. Impact: Schroder paced the second unit with an impressive all-around performance, The veteran's playing time have been solid over the first three games against the Trail Blazers, as he's logged over 30 minutes in two of those contests. The 25-year-old has been especially proficient from distance, as he's drained eight of his 11 attempts from behind the arc thus far in the series. News: Grant contributed 18 points (6-7 FG, 4-5 3Pt, 2-2 FT), two rebounds, one assist and two blocks across 33 minutes during the Thunder's 120-108 win over the Trail Blazers in Game 3 of their Western Conference first-round playoff series Friday. Impact: Grant was a significant offensive component for the Thunder in their first win of the series, putting together a performance reminiscent of many he generated during a breakout regular season. It was the first double-digit scoring effort of the series for Grant, who'd only averaged 6.5 points through the first two games. Improved efficiency made all the difference Friday, as Grant's 85.7 percent success rate from the floor was a stark departure from his 3-for-15 showing in Games 1 and 2. News: George delivered 22 points (3-16 FG, 2-7 3Pt, 14-17 FT), six rebounds, six assists and one steal across 41 minutes during the Thunder's 120-108 win over the Trail Blazers during Game 3 of their Western Conference first-round playoff series Friday. Impact: George endured an absolutely forgettable night from the field, but he salvaged his final line to a large extent with a game-high 17 visits to the free-throw line. The veteran wing has scored at least Friday's 22 points in each of the series' first three games, although he's been far from efficient overall. George has now shot well under 40.0 percent in two contests against the Trail Blazers, and he's posted a sub-30.0 percent success rate from three-point range in each of Games 1-3. Although George has insisted his troublesome shoulder isn't bothering him, there seems to be plenty of evidence to support the notion it's having an adverse impact to some degree. News: Westbrook registered 33 points (11-22 FG, 4-6 3Pt, 7-8 FT), 11 assists, five rebounds and one block across 38 minutes during the Thunder's 120-108 win over the Trail Blazers in Game 3 of their Western Conference first-round playoff series Friday. Impact: After a forgettable Game 2 performance that Westbrook himself termed unacceptable, the perennial All-Star bounced back in fine fashion Friday. Westbrook's scoring total was a series high, while his assists tied his series-best Game 2 tally in that department. The veteran point guard now has two strong shooting performances over the first three games of the series, and he'll look to stay hot in Sunday's Game 4 as OKC looks to even the series at 2-2. News: Diallo underwent arthroscopic surgery on his right elbow Wednesday, Maddie Lee of The Oklahoman reports. He's expected to be withheld from basketball activities for the next four weeks. Impact: Diallo wasn't available for either of the Thunder's first two playoff games, and it appears the injury is more serious than initially noted. Given his timeline to resume activity, there's a strong chance Diallo won't be available for the remainder of the playoffs. News: Westbrook amassed 14 points (5-20 FG, 1-6 3Pt, 3-3 FT), 11 assists, nine rebounds, and one steal in 37 minutes during Tuesday's 114-94 loss to the Trail Blazers. Impact: The Thunder fell away late, eventually falling to the Trail Blazers by 20 points in Game 2 of their best of seven series. Westbrook struggled from the field, ending just 5-of-20 including 1-of-6 from beyond the arc. He is now a combined 1-of-10 from the perimeter and will certainly need to improve if the Thunder are to make this a competitive series moving forward. Game 3 is on Friday in Oklahoma City which should certainly work in the favor of Westbrook and the rest of his underperforming teammates. News: George finished with 27 points (11-20 FG, 2-7 3Pt, 3-4 FT), eight rebounds, three assists, and one steal in 41 minutes during Tuesday's 114-94 loss to Portland. Impact: George led the Thunder with 27 points but unfortunately received very little support on the offensive end. He continues to battle with an ongoing shoulder issue but did appear somewhat untroubled in this one. The fact he played 41 minutes indicates he should be good to go for what is now a must-win game Friday. A loss would see the Thunder fall behind 3-0 with a comeback highly unlikely from that position. News: Diallo (elbow) won't play against the Trail Blazers on Tuesday, Jamie Hudson of NBC Sports Northwest reports. Impact: Diallo has missed the previous four contests due to an elbow injury, although given his limited contributions for the Thunder this year off the bench, his absence shouldn't impact the outcome of the game all that much. He averaged 3.7 points and 1.9 rebounds over 51 matchups during the regular season. 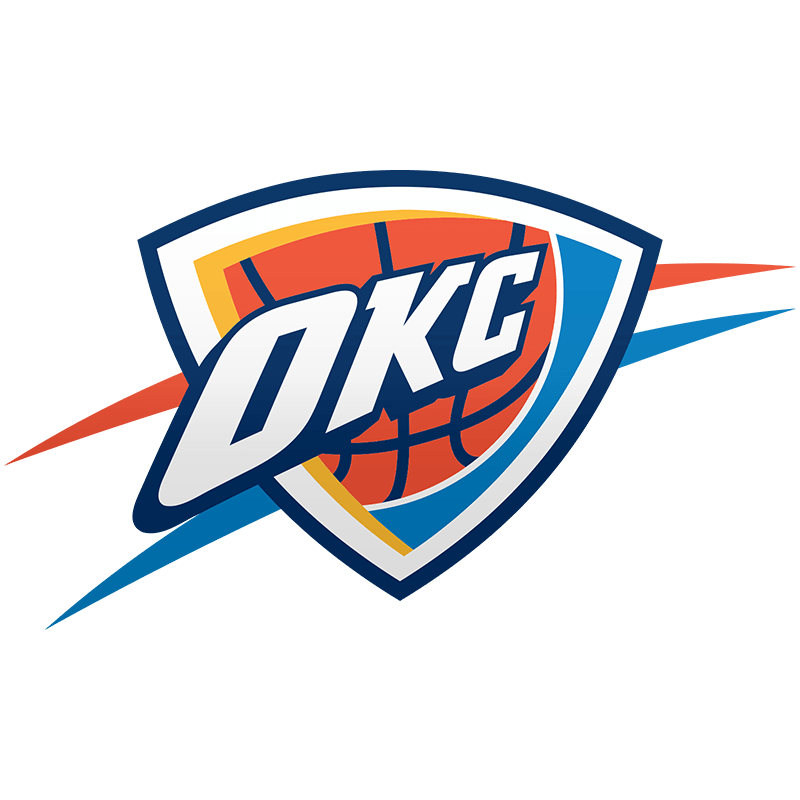 News: Westbrook went through a full practice Monday, Erik Horne of The Oklahoman reports. Impact: Westbrook wasn't listed on the initial injury report, though he did appear to tweak his ankle during Sunday's Game 1 loss to Portland. At this juncture, there's little reason to believe Westbrook will face any limitations when the Thunder look to even the series Tuesday night in Portland. News: George went through all aspects of Monday's practice and insists his shoulder is pain-free, Royce Young of ESPN.com reports. Impact: George claims that his shoulder issue is behind him, but he was spotted with a big bag of ice on the shoulder following Monday's practice session, per NBC Sports Northwest. This is good news if true, although he struggled mightily with his shot in Game 1 against Portland and will attempt to find his rhythm Tuesday in Game 2. News: Grant chipped in eight points (2-8 FG, 0-3 3Pt, 4-4 FT), five rebounds, four blocks, and one steal in 35 minutes during Sunday's 104-99 Game 1 loss to the Trail Blazers. Impact: Grant struggled offensively but made his presence felt on the defensive end. Given the team's lack of depth along the wing, Grant is likely to continue earning heavy minutes throughout the course of the playoffs. News: Westbrook racked up 24 points (8-17 FG, 0-4 3Pt, 8-8 FT), 10 rebounds, and 10 assists in 38 minutes during Sunday's 104-99 Game 1 loss to the Trail Blazers. Impact: Westbrook couldn't buy a bucket from beyond the arc but still put forth a fairly efficient scoring performance while making his usual contributions in the rebounding and assist departments. The triple-double machine will more than likely remain in attack mode as he tries to help his team even the series in Tuesday's Game 2. News: George recorded 26 points (8-24 FG, 4-15 3Pt, 6-6 FT), 10 rebounds, and four steals in 43 minutes during Sunday's 104-99 Game 1 loss to the Trail Blazers. Impact: George returned to the lineup after missing the regular season finale with a right shoulder injury. He struggled with his shot in this one, which suggests he's indeed still dealing with some discomfort. Nevertheless, George salvaged his stat line by hauling in boards galore and swiping several steals. News: Diallo will not play in Sunday's playoff contest against Portland due to a right elbow injury, Jamie Hudson of NBC Sports Northwest reports. Impact: Diallo hasn't been a factor all season long for the Thunder but nevertheless, he will remain on the sidelines permanently during Sunday's matchup with the Trail Blazers. News: George (shoulder) is available to play and will start in Sunday's playoff contest against Portland, Erik Horne of The Oklahoman reports. Impact: No surprise here as George will return to the court for Game 1 of the 2019 NBA Playoffs after missing the season finale against the Bucks with a right shoulder injury. There is no mention of a possible minutes restriction as well, so expect George to be a full-go for Sunday's matchup against Portland. News: George (shoulder) will be a game-time decision for Sunday's playoff matchup against the Trail Blazers, Brett Dawson of The Athletic reports. Impact: George missed Wednesday's season finale against the Bucks with right shoulder soreness and the same injury is making him appear on the injury report for Sunday's Game 1 contest. The Fresno State product will reportedly be a game-time call Sunday and any news confirming his status should surface soon. If George is ruled out however, Abdel Nader may be in line for a spot start. News: George (shoulder) is officially listed as questionable for Sunday's Game 1 against the Trail Blazers, Casey Holdahl of the Trail Blazers' official site reports. Impact: George intimated earlier in the week that he expects to play, so his listing may simply be a formality. Still, it's worth noting that he's dealing with some discomfort and may be less than 100 percent in the early goings of the postseason. News: George (shoulder) said he expects to play in Sunday's game against the Trail Blazers, Royce Young of ESPN.com reports. Impact: George revealed that the shoulder injury that kept him out of Wednesday's regular-season finale against the Bucks is somewhat serious, as he was in far too much pain to take the floor, but it looks like it is going to take a lot more than that to keep the All-Star forward out of the lineup in Game 1. Head coach Billy Donovan said George is day-to-day, but it looks like he is on track to play barring any setbacks. News: Head coach Billy Donovan said George (shoulder) is day-to-day, Brett Dawson of The Athletic reports. Impact: The Thunder didn't go through a legitimate practice Friday, so it's unclear where George is at physically, but more clarity on his status should come Saturday. At this point, it would still be fairly surprising if George was not healthy enough to play in Sunday's Game 1 in Portland, but there is still a lot that needs to be cleared up regarding his health. News: Grant scored a season-high 28 points (11-20 FG, 4-8 3Pt, 2-2 FT) while adding five rebounds and an assist in 43 minutes during Wednesday's 127-116 win over the Bucks. Impact: With Paul George (shoulder) sidelined for the regular-season finale, Grant took full advantage of the extra shots available. The 25-year-old heads into the playoffs with some momentum, scoring in double digits in eight straight contests, but he'll be firmly in a supporting role as Russell Westbrook and James Harden do battle in a first-round clash between the Thunder and Rockets. News: Schroder scored a game-high 32 points (10-21 FG, 8-15 3Pt, 4-4 FT) while adding five rebounds, four steals and three assists in 40 minutes during Wednesday's 127-116 win over the Bucks. Impact: Getting a start in place of Paul George (shoulder), Schroder tied his season high in scoring and blew past his previous season best (five) in made three-pointers. The 25-year-old had some trouble establishing himself in his first season with OKC, but he has the potential to make a difference in the Thunder's first-round tilt with the Rockets. News: Westbrook scored 15 points (7-10 FG, 1-3 3Pt, 0-2 FT) while adding 17 assists, 11 rebounds, a steal and a block in 36 minutes during Wednesday's 127-116 win over the Bucks. Impact: OKC had more to play for than Milwaukee in this one, and as a result Westbrook racked up his third straight triple-double and 34th of the season. The 30-year-old averaged a triple-double for the third straight season -- one of the greatest feats in NBA history -- and tied Lakers great Magic Johnson for the second-most in league history. Westbrook will get a few days to prepare for a clash with James Harden and the Rockets in the marquee matchup of the first round of the playoffs. News: Schroder will start Wednesday's game against the Bucks. Impact: Schroder's move into the starting five comes in place of the injured Paul George. Schroder's averaging 31.1 minutes per game since the start of March, and could see an even larger role with the starters. News: George (shoulder) has been listed as inactive for Wednesday's game against the Bucks, Brett Dawson of The Athletic reports. Impact: Despite playing 42 minutes and hitting a game-winner Tuesday against Houston, George won't play in Wednesday's season-finale against Milwaukee due to a right shoulder injury that's continued to hamper him for the past month. In his absence, look for Abdel Nader and Hamidou Diallo to see a boost in minutes. News: George (shoulder) will be a game-time decision Wednesday against the Bucks, Maddie Lee of The Oklahoman reports. Impact: George's shoulder continues to bother him, and it may prevent him from playing in the regular-season finale. He'll warm up and see how it feels before a final decision is made. News: George is questionable for Wednesday's regular-season finale against the Bucks due to right shoulder soreness, Royce Young of ESPN.com reports. Impact: George continues to deal with a sore shoulder, which has plagued him since late February. If he misses Wednesday's contest, Markieff Morris and Dennis Schroder figure to see increased usage. News: Ferguson compiled 16 points (6-10 FG, 3-6 3Pt, 1-1 FT), three rebounds, and one assist in 26 minutes during Tuesday's 112-111 victory over Houston. Impact: Ferguson scored 16 points in Tuesday's victory, the most he has scored in over three months. Despite starting for the Thunder, Ferguson has been a non-factor in competitive formats, even struggling to have value as a streaming option. There is no reason to think his value will rise dramatically heading into next season leaving him as a deeper league asset only. News: Westbrook totaled 29 points (11-23 FG, 4-10 3Pt, 3-3 FT), 12 rebounds, and 10 assists in 37 minutes during Tuesday's 112-111 victory over the Thunder. Impact: Westbrook's final assist of the game led to Paul George hitting a game-winning three-pointer, also handing Westbrook his fourth triple-double from his last five games. Westbrook will finish the regular season averaging a triple-double for the third straight time. His counting stats are amazing, however, he is also averaging 4.5 turnovers per game while shooting 42.6 percent from the field and 65.9 percent from the free-throw line. News: George finished with 27 points (9-25 FG, 4-14 3Pt, 5-6 FT), nine rebounds, four steals, and three assists in 42 minutes during Tuesday's 112-111 victory over the Rockets. Impact: George drilled a three-pointer with under two seconds remaining Tuesday, giving the Thunder a much-needed victory over a full-strength Rockets team. The victory means the Thunder now control their own destiny with another victory Wednesday ensuring they finish as the sixth-seed. It is four wins in a row for the Thunder who now head into the final regular season game against the Bucks with supreme confidence. George has tailed off towards the back end of the season but nonetheless, has had himself an MVP caliber season. News: Grant tallied 15 points (5-7 FG, 2-3 3Pt, 3-4 FT), five rebounds and two blocks over 30 minutes Sunday against the Timberwolves. Impact: Grant put together an efficient shooting line and swatted two shots on the way to a winning effort. He's finished in double figures in the scoring column in five straight matchups and has also snagged five or more boards in three of those contests. Grant and the Thunder will face two dangerous opponents in the final two regular-season games of the season, although either team may elect to rest some of their usual starters in an effort to being the playoffs well rested. News: Schroder finished with 21 points (8-15 FG, 1-3 3Pt, 4-4 FT), two rebounds, an assist and a steal over 32 minutes Sunday against the Timberwolves. Impact: Schroder logged big minutes off the bench and played a key role in Oklahoma City's 132-126 victory. The 25-year-old has been red hot to begin the month of April, scoring 14 or more points in each of the previous three games. Schroder will aim to maintain this level of production with only two matchups remaining in the regular season. News: Westbrook finished Sunday's game against Minnesota with 27 points (10-22 FG, 2-6 3Pt, 5-7 FT), 10 rebounds, 15 assists and a steal over 38 minutes. Impact: Westbrook and Paul George each finished with 27 points, as the Thunder needed both of their stars' contributions in a must-win matchup. Westbrook has poured in 20-plus points in four of his previous five matchups and he's likely to sustain this type of effort during the final two games of the regular season considering the Thunder are hanging on to a playoff spot by a thread. News: George racked up 27 points (8-22 FG, 4-13 3Pt, 7-7 FT), seven rebounds, six assists and three steals over 38 minutes Sunday against Minnesota. Impact: George had a below-average shooting day, but he still finished the contest tied for the team lead in scoring. The Fresno State product continues to find success late in the season and is averaging 26.9 points along with 8.3 rebounds and 3.7 assists over his last 10 matchups. The Thunder are clinging to a playoff spot by a thread, so the final two contests of the regular season will be of utmost importance. News: Noel finished with six points (2-2 FG, 2-2 FT), four rebounds, four steals, and two blocks in 16 minutes during Friday's 123-110 win over the Pistons. Impact: Noel filled up the stat sheet despite earning limited minutes. Not only did he snap an 11-game streak in which he swiped zero steals, Noel matched his season high in that category. Still, despite his defensive abilities, Noel typically doesn't earn enough minutes to warrant consideration outside of deeper formats. News: Schroder pitched in 14 points (6-14 FG, 1-5 3Pt, 1-1 FT), 10 assists, seven rebounds, and one steal in 31 minutes during Friday's 123-110 win over the Pistons. Impact: Schroder was spectacular overall, coming fairly close to logging a triple-double in this one. This was actually just his third double-double of the campaign, his lowest total in that category since 2015-16 (two). However, Schroder has been a strong third option offensively all season, and his stats haven't dropped off as much as one might have assumed they would after being the top option for the Hawks in 2016-17 and 2017-18. News: George provided 30 points (11-24 FG, 4-7 3Pt, 4-4 FT), eight rebounds, four assists, and two steals in 36 minutes during Friday's 123-110 win over the Pistons. Impact: George has perhaps fallen out of the MVP race as the Thunder have slid down the Western Conference standings. Still, the 28-year-old forward is enjoying his best season, and he'll try to help his team avoid a first round matchup with the Warriors by continuing to perform at a high level down the stretch. News: The Thunder have all but ruled Roberson (kneecap) out for the remainder of the regular season and playoffs, Royce Young of ESPN.com reports. Impact: Roberson hasn't appeared in a game at any level since Jan. 27, 2018, with the defensive ace enduring multiple setbacks in his recovery from surgery to repair a ruptured patellar tendon in his left knee. The Thunder were hopeful that Roberson would be ready to test out his knee in rehab games with the G League's Oklahoma City Blue, but that's no longer a possibility with the Blue's season having come to an end. As a result, Roberson won't have an opportunity to prove his health outside of practices, but coach Billy Donovan noted that the Thunder medical staff has given no indication the 27-year-old is "anywhere near" a return to game action. Roberson would have to demonstrate significant improvement and the Thunder would have to enjoy a deep postseason run for him to even have a slight chance at playing in 2018-19. News: George produced 19 points (8-17 FG, 3-8 3Pt), six rebounds, five assists, five steals, and one block in 38 minutes during Tuesday's 119-103 win over the Lakers. Impact: George snagged at least five steals for the sixth time through 74 appearances this season. Having already recorded a career-high 24 double-doubles, George will look to put the exclamation mark on the best campaign of his career as the Thunder compete for playoff positioning across the final four regular season games. News: Grant registered 22 points (8-15 FG, 4-10 3Pt, 2-3 FT), five rebounds, one assist, and one steal in 35 minutes during Tuesday's 119-103 win over the Lakers. Impact: Grant has gone for at least 20 points twice over the last eight tilts while draining at least four treys in three of the last six. His offensive game, most notably from beyond the arc, has improved by leaps and bounds this season, and he was always just a jump shot away from being a quality two-way player. Expect him to remain highly involved down the stretch while the Thunder jostle for playoff positioning. News: Westbrook went off for 20 points (8-23 FG, 2-9 3Pt, 2-3 FT), 21 assists, 20 rebounds, and three steals in 37 minutes during Tuesday's 119-103 win over the Lakers. Impact: Westbrook was a man on a mission in this one, as he became just the second player in NBA history to record at least 20 points, 20 rebounds, and 20 assists (the other being Wilt Chamberlain). Assuming the Thunder will try to outpace the Spurs for the seventh seed in the Western Conference, Westbrook and the rest of the starting five can likely be expected to continue logging plenty of minutes across the final four regular season matchups. News: Ferguson scored two points (0-1 FG, 0-1 3Pt, 2-2 FT), one assist and one steal over 31 minutes in the Thunder's loss to the Nuggets on Friday. Impact: Ferguson's presence was practically nonexistent in Friday's loss as he scored just two points and did little else. Despite a starting gig and a healthy allotment of minutes, Ferguson has managed to score in double-digits jut twice in his last 16 games and hasn't recoded a double-double all season. He's not a viable fantasy option in nearly all formats. News: Westbrook finished with 27 points (11-22 FG, 1-5 3Pt, 4-5 FT), nine rebounds, nine assists and two steals over 36 minutes in the Thunder's loss to the Nuggets on Friday. Impact: Westbrook was just shy of another triple-double in Friday's loss, needing just one rebound and one assist to reach that mark. He's averaged a triple-double in 2019, and games like Friday's are the norm for Westbrook. Despite his poor shooting and some real-world basketball issues, Westbrook is an incredibly valuable fantasy asset across all formats. News: George finished with 25 points (10-22 FG, 2-7 3Pt, 3-5 FT), nine rebounds and four assists over 40 minutes in the Thunder's loss to the Nuggets on Friday. Impact: George had a solid performance on Friday, but it wasn't enough to keep the Thunder from sliding more in the Western Conference standings. He's gone for at least 25 points in four straight, grabbing nearly eight boards per game in that span. George is an elite and dependable option at the small forward position. News: George is available and will start Friday's game against Denver, Brett Dawson of The Athletic reports. Impact: George was listed as a game-time call due to shoulder soreness, but he's ready to roll and should handle his usual workload. The MVP candidate is averaging 27.8 points, 7.2 boards and 4.0 assists over his previous five matchups. News: George (shoulder) will play and start in Friday's matchup against the Nuggets, Royce Young of ESPN.com reports. Impact: George was considered a game-time decision due to an ailing shoulder, but it appears he passed all the tests he needed to during pregame warmups. Look for him to take on his usual role barring any setbacks. News: George (shoulder) is a game-time decision Friday against the Nuggets, Brett Dawson of The Athletic reports. Impact: George will go through his pregame routine before determining if he'll take the floor. An absence would likely result in Abdel Nader, Hamidou Diallo and Markieff Morris seeing expanded roles. News: George is questionable for Friday's matchup against the Nuggets due to left shoulder soreness, Brett Dawson of The Athletic reports. Impact: George is shooting just 39.8 percent from the field since returning from a three-game absence caused by a shoulder injury, and it's apparent the issue is still bothering him. He'll likely test things out during morning shootaround and/or pregame warmups before determining if he can play against the Nuggets. If George ends up missing the contest, Abdel Nader, Hamidou Diallo and Markieff Morris are candidates to see extra usage. News: Westbrook scored 17 points (6-15 FG, 2-4 3Pt, 3-4 FT) while adding 12 assists, 11 rebounds, two steals and a block in 37 minutes during Wednesday's 107-99 win over the Pacers. Impact: It's his 29th triple-double of the season, including four in his last seven games, and the 133rd of his career -- leaving Westbrook five shy of Magic Johnson for second place on the NBA's all-time list. Barring a late collapse in his assists, he should also average a triple-double for the third straight campaign, an astounding feat considering Oscar Robertson is the only other player in league history to even do it once. News: George scored a game-high 31 points (12-25 FG, 4-13 3Pt, 3-3 FT) while adding four rebounds, an assist and a steal in 39 minutes during Wednesday's 107-99 win over the Pacers. Impact: It's his second straight game, and his fourth in the last seven contests, with at least 30 points. George remains second in the NBA in scoring behind James Harden, and his career year has helped keep the Thunder in the playoff picture in the increasingly competitive Western Conference. News: Burton totaled two points (1-3 FG, 0-2 3Pt), three rebounds, and one assist in eight minutes during Monday's 115-103 loss to the Grizzlies. Impact: Burton has earned single-digit minutes in seven of eight appearances since the All-Star break and hasn't reached double figures in scoring since Feb. 11. Despite recently having his two-way contract converted into a full NBA deal, Burton doesn't possess much appeal across most fantasy formats. News: Ferguson collected 13 points (4-4 FG, 3-3 3Pt, 2-2 FT), three rebounds, three assists, and two steals in 36 minutes during Monday's 115-103 loss to the Grizzlies. Impact: Ferguson was on fire offensively, but unfortunately he wasn't involved enough to turn the tides for his team. He has now scored in double figures in consecutive contests, this after being limited to single digits in 13 straight prior to Friday's win over the Raptors. News: Schroder supplied 25 points (9-14 FG, 2-4 3Pt, 5-6 FT), three rebounds, and three assists in 37 minutes during Monday's 115-103 loss to the Grizzlies. Impact: Schroder was extremely efficient as a scorer on a night when Russell Westbrook and Paul George combined to score 46 points on 16-of-49 from the field. It was an ugly loss for a Thunder team still jostling for playoff positioning in the crowded Western Conference. Nevertheless, Schroder and company will look to bounce back during Wednesday's matchup with the Pacers. News: Evans was claimed off waivers by Oklahoma City on Monday, Shams Charania of The Athletic reports. Impact: Evans was waived by the Suns on Saturday, and although initial indications pointed to him signing with the Rockets, he's wound up with the Thunder on a two-way contract. He hasn't taken the court in an NBA game since Feb. 13 and is averaging under one point over seven contests this season. News: Schroder finished with 26 points (10-16 FG, 4-7 3Pt, 2-2 FT), seven assists, six rebounds, and one block in 31 minutes during Friday's 116-109 win over the Raptors. Impact: Schroder took Toronto to school, delivering an efficient scoring performance while filling up the box score. He remains the clear go-to option off the pine. Moreover, Russell Westbrook often defers to Schroder when the two share the court in an effort to keep him involved. With the Western Conference playoff teams all fighting for playoff positioning in some way, shape, or form, Schroder should be expected to keep earning ample minutes across the final nine regular season games here in 2018-19. News: Westbrook went for 18 points (6-20 FG, 2-9 3Pt, 4-5 FT), 13 assists, 12 rebounds, four steals, and one block in 37 minutes during Friday's 116-109 win over the Raptors. Impact: Westbrook struggled with his shot but produced across every category while racking up his 28th triple-double of the season. Given that the Thunder are still battling for playoff positioning, it's likely that Westbrook will remain in attack mode (as per usual) for most of the last nine regular season games. News: George registered 28 points (9-17 FG, 5-10 3Pt, 5-5 FT), six rebounds, five assists, two steals, and one block in 41 minutes during Friday's 116-109 win over the Raptors. Impact: George was extremely efficient as a scorer while contributing in every category and helping his team earn revenge after Wednesday's overtime loss to these same Raptors. With most of the playoff teams in the Western Conference jumbled closely together in the standings, George and company can likely be expected to continue competing for home-court advantage across the final nine games of the regular season. News: Noel had nine points, one rebound, one assist, and one block in 11 minutes during Wednesday's 123-114 loss to Toronto. Impact: Noel returned after missing the Thunder's last game with a quad bruise but played just 11 minutes in the overtime loss. His playing time has waned over the past few games and outside of his serviceable block numbers, he is not worth a look in standard formats. News: Schroder ended with 12 points (5-16 FG, 1-6 3Pt, 1-2 FT), seven rebounds, four assists, and one steal in 38 minutes during Wednesday's 123-114 loss to the Raptors. Impact: Schroder moved back to the bench Wednesday with Russell Westbrook back in the lineup after a one-game suspension. Schroder still played 38 minutes in the overtime loss but finished just 5-of-16 from the field and 1-of-2 from the free-throw line. Schroder is a fringe standard league player with very little upside outside of scoring. Russell Westbrook is a chance to miss more games before the season ends and if that is the case, Schroder then becomes a must-start player. News: Westbrook finished with 42 points 16-29 FG, 5-10 3Pt, 5-8 FT), 11 rebounds, six assists, and one steal in 44 minutes during Wednesday's 123-114 loss to the Raptors. Impact: Westbrook returned from a one-game suspension, scoring a game-high 42 points in the overtime loss to the Raptors. The Thunder came from 18 points back to force overtime but eventually ran out of steam. Westbrook was fantastic, scoring more than the other four starters combined. He is going to be a risky layer down the stretch with every second technical four resulting in a one-game suspension. News: Noel (quad) is available to play in Wednesday's game agaisnt the Raptors, Brett Dawson of The Athletic reports. Impact: As expected, Noel, who was dealing with a bruise on his left quad, will be able to play Wednesday. Through 66 games, Noel's averaging 5.0 points, 4.5 rebounds and 1.3 blocks in 14.2 minutes per contest. News: Noel (quad) will be a game-time decision for Wednesday's tilt with the Raptors, Brett Dawson of The Athletic reports. Impact: Coach Billy Donovan is "pretty optimistic" that Noel will be able to play after missing Monday's game against Miami due to a bruise on his left quadriceps. Noel will go through pregame before ultimately making the final call on his availability. News: Noel (quad) is questionable for Wednesday's matchup against the Raptors, Erik Horne of The Oklahoman reports. Impact: Noel was a late scratch for Monday's contest, but it appears he's close to a return. He may opt to test things out pregame before making a final decision on his availability. News: Grant finished with 27 points (10-16 FG, 1-2 3Pt, 6-7 FT), 10 rebounds, three blocks and an assist over 41 minutes in the Thunder's loss to the Heat on Monday. Impact: Grant went off for a season-high 27 points in Monday's loss, adding 10 rebounds for a big double-double. It was just his fourth double-double this season, but Grant is still averaging career highs in points (13.1) and rebounds (5.1) this season. News: Schroder totaled 20 points (7-16 FG, 2-5 3Pt, 4-6 FT), six assists and three rebounds over 36 minutes in the Thunder's loss to the Heat on Monday. Impact: Schroder had a big game in Monday's win, drawing the start in Russell Westrbook's absence due to suspension. Schroder has been a fine fantasy play this season and an even better option when Westbrook has missed time. News: George totaled 31 points (9-18 FG, 4-11 3Pt, 9-9 FT), nine rebounds, five assists, two steals and two blocks over 39 minutes in the Thunder's loss to the Heat on Monday. Impact: George led all scorers in Monday's loss, though his big night wasn't enough to lead the Thunder to a win. Already having his best year as a pro, George has stepped up his scoring and rebounding as of late, averaging 30.0 points and 9.1 rebounds over his last four games. News: Noel has been ruled out of Monday's game against the Heat with a left quad contusion, Erik Horne of The Oklahoman reports. Impact: It's unclear when Noel suffered the injury, however with it just being labeled a contusion, it doesn't seem to be a serious injury. He should be considered questionable for Wednesday's game against Toronto. In his absence, Markieff Morris and Patrick Patterson could see a larger role. News: Schroder will start at point guard Monday against the Heat, Maddie Lee of The Oklahoman reports. Impact: No surprise here, as the Thunder will be without Russell Westbrook on Monday after he picked up his 16th technical foul of the season over the weekend. Expect Schroder to see a bump in playing time, though he's already averaged just a shade under 30 minutes per game in his last seven contests off the bench. News: Westbrook has been suspended for Monday's game against the Heat after receiving his 16th technical foul, Tomer Azarly of ClutchPoints.com reports. Impact: This suspension comes as no surprise, as Westbrook received his 16th technical foul this season in Saturday's loss to Golden State. In his absence, Dennis Schroder will likely move into the starting five and could see an increased role. Westbrook will return Wednesday against Toronto. News: Ferguson finished with two points (1-5 FG, 0-3 3Pt) and two rebounds in 27 minutes during Saturday's 110-88 loss to the Warriors. Impact: Ferguson finished with as many turnovers as points, and he was essentially a non-factor in this one. The 20-year-old sophomore has made significant strides this season, but he has been limited to single digits in scoring for 11 consecutive contests. Moreover, he doesn't do much else on a consistent basis, so Ferguson's fantasy value seems minimal at best until he snaps out of his recent funk. News: Westbrook managed seven points (2-16 FG, 0-7 3Pt, 3-4 FT), nine assists, eight rebounds, one steal, and one block in 32 minutes during Saturday's 110-88 loss to the Warriors. Impact: Westbrook had an awful night offensively, finishing with over twice as many field goal attempts as points in a blowout defeat. It's the third time here in 2018-19 that he has failed to reach double figures in scoring, and this was his lowest point total thus far this season. Westbrook will look to bounce back during Monday's matchup versus the Heat. News: George recorded 29 points (9-25 FG, 4-12 3Pt, 7-11 FT), 13 rebounds, two assists, and one steal in 38 minutes during Saturday's 110-88 loss to the Warriors. Impact: George was highly inefficient from the field but made enough threes, sunk enough free throws, and grabbed enough boards to salvage his overall stat line. He now has 22 double-doubles through 66 appearances this season, which puts him only one away from matching his career high (23 in 2012-13). News: Morris had eight points (3-7 FG, 2-3 3Pt), five rebounds, and one steal in 17 minutes during Saturday's 110-88 loss to the Warriors. Impact: Morris has amassed eight points across 17 minutes in each of the last two contests, contributing nearly identical stat lines. He has had some good games here and there since joining the Thunder in late February, but thus far Morris hasn't been able to earn enough minutes to make a consistent impact outside of deeper formats. News: Morris (neck) will be active and could play Thursday against the Pacers, Erik Horne of The Oklahoman reports. Impact: Morris was initially listed as out by the Thunder, but he'll end up being a true game-time call. "He's trying to play. I think he feels considerably better than he did yesterday," stated head coach Billy Donovan. Morris will go through pregame warmups before being reevaluated, at which point his status will be revealed. News: Morris (neck) is listed as out for Thursday's game against the Pacers, Brett Dawson of The Athletic reports. Impact: A neck injury cost Morris a chunk of time earlier this season, and the issue appears to have resurfaced of late. Thursday will mark his second straight absence after he was held out of Wednesday's win over the Nets. News: Westbrook contributed 31 points (12-23 FG, 4-8 3Pt, 3-5 FT), 12 rebounds, 11 assists and three steals across 35 minutes during Wednesday's win over the Nets. Impact: Westbrook provided his typical extraordinary line during Wednesday's win over the Nets. The only recent change to Westbrook's play is that he's finally shooting the ball well. After struggling for the first four months of the season, Westbrook's hitting 47.4 percent of his shots from the field and 38.8 percent of his threes in March. News: George tallied 25 points (9-18 FG, 3-6 3Pt, 4-4 FT), nine rebounds, three assists, two steals and two blocks in 36 minutes during Wednesday's win over Brooklyn. Impact: After falling well below his season scoring average the past two games, George bounced back to top 25 points for the third time since returning from his brief shoulder injury. In his four prior games since returning, George had made just 30.5 percent of his shots from the field. If he's able to bounce back to his pre-injury form, George can be considered a top-level fantasy asset for the remainder of the season. News: Morris (neck) will not play in Wednesday's game against the Nets, Royce Young of ESPN.com reports. Impact: After undergoing pregame warm-ups, Morris' neck was still bothering him too much to play Wednesday. In his absence, Patrick Patterson could see an increased role. Morris should be considered questionable for Thursday's game against the Pacers. News: Morris (neck) is listed as questionable for Wednesday's game against the Nets, Erik Horne of The Oklahoman reports. Impact: Morris left Monday's game against the Jazz after suffering the neck injury. His status Wednesday will depend on how he is feeling closer to tip-off. Patrick Patterson could see a return to the rotation should he ultimately sit out. News: George totaled 14 points (2-8 FG, 0-3 3Pt, 10-12 FT), 11 rebounds, four assists, three steals, and one block in 35 minutes during Monday's 98-89 win over the Jazz. Impact: George had been stellar across his first three tilts against the Jazz this season, perhaps fueled by last year's playoff defeat. He was stymied offensively in this one though, as he failed to sink a three for the first time since Nov. 1 (though he did live at the charity stripe). Overall, George made up for his quiet night as a scorer by producing a fairly well-rounded stat line. Still, he'll look to shake off his recent offensive struggles over the last two games (combined for 29 points and 10 turnovers versus five dimes) in a much more favorable matchup versus an uptempo Nets team on Wednesday. News: Westbrook produced 23 points (9-19 FG, 2-4 3Pt, 3-6 FT), 11 rebounds, eight assists, one steal, and one block in 37 minutes during Monday's 98-89 win over the Jazz. Impact: Westbrook fell two dimes shy of a triple-double but provided a little bit of everything in this one. Wednesday's matchup with a Nets team that plays at a much faster pace than the Jazz projects as a promising matchup for those thinking about shelling out for Westbrook in daily leagues. News: Schroder recorded 24 points (10-18 FG, 2-5 3Pt, 2-3 FT), seven rebounds, and three assists in 30 minutes during Monday's 98-89 win over the Jazz. Impact: Schroder paced the Thunder in scoring while amassing double figures for the ninth consecutive contest. He has earned at least 30 minutes in seven of the last 10 games and continues to maintain a fairly high usage rate as the team's third-best offensive player behind Russell Westbrook and Paul George. News: Morris is doubtful to return to Monday's game against the Jazz after leaving the game with neck soreness, Brett Dawson of The Athletic reports. Impact: Morris managed just eight minutes Monday before being forced to leave with neck soreness. If he is unable to return, he should be considered questionable for Wednesday against the Nets. News: Burton and the Thunder agreed to terms on a multi-year deal Sunday, Shams Charania of The Athletic reports. Impact: The main implication is that Burton's two-way contract has now been converted to a full NBA deal, so he'll be playoff-eligible with a little more security. The details of the contract have not been disclosed, but it likely includes a team option or partial guarantee. News: Noel ended with six points, five rebounds, two assists, two steals, and two blocks in 16 minutes during Friday's 118-110 loss to the Clippers. Impact: Noel was dynamic off the bench Friday, providing solid effort on both ends of the floor. He has the best +/- of any of the Thunder players and may have seen more court time had he not been in foul trouble himself. Noel typically sees too few minutes to have any real value outside of being a blocks streamer. News: Morris tallied 12 points (5-10 FG, 1-2 3Pt, 1-2 FT), seven rebounds, and one assist in 17 minutes during Friday's 118-110 loss to the Clippers. Impact: Morris played well off the bench for the Thunder on Friday, helping keep things close down the stretch. He has struggled to have any real fantasy value since moving to Oklahoma City and the fact he only played 17 minutes with many of the starting unit in foul trouble, does not bode well for things moving forward. He can be left on the waivers in all competitive formats at this stage. News: George produced 15 points (5-16 FG, 3-9 3Pt, 2-4 FT), six rebounds, and one assist in 28 minutes during Friday's 118-110 loss to the Clippers. Impact: George fouled out after just 28 minutes Friday, ending the game with 15 points on 5-of-16 shooting. On the second night of a back-to-back, many of the Thunder players appeared lethargic and the reduced playing time may not be an altogether bad thing for George. Despite continuing to put up some gaudy numbers, George has struggled with his shot of late. Whether this is related to his shoulder injury is not clear, however, it is something for his owners to monitor moving forward.